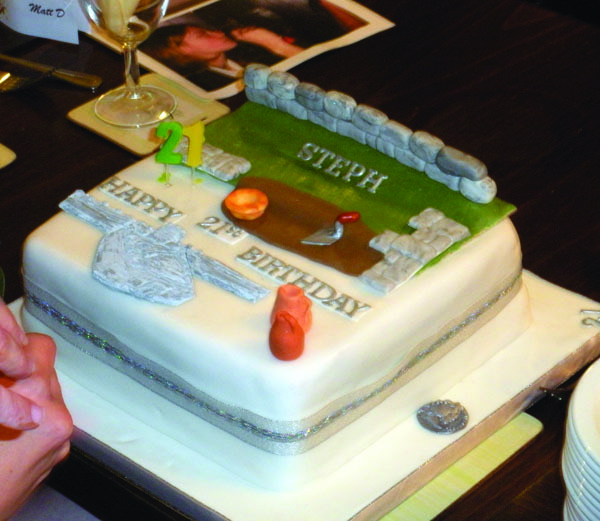 For Steph Turville’s 21st birthday, her parents had an archaeological birthday cake made for her — the decoration was a Roman fort and possible finds. A week after her birthday she was going to an excavation at Birdoswald Roman Fort on Hadrian’s Wall, a joint project between English Heritage and Newcastle University. Steph was one of the students in the Newcastle team. All the decorations on the cake were edible, though she couldn’t bring herself to eat the trowel! Sent in by Steph Turville from Rutland, featured in issue 256 of Current Archaeology.